Add a quiet elegance to your bedroom with this transitional queen bed. Featuring steel tubing construction and a hand-brushed antique champagne finish, this bed works as the perfect understated centerpiece to any low-key bedroom. The touch of style added by the mold-casted ornaments ensure that you this bed will remain a fashionable part of your sanctuary for years to come. The Micah Transitional Queen Bed with Mold-Casted Ornaments by Coaster at Value City Furniture in the New Jersey, NJ, Staten Island, Hoboken area. Product availability may vary. Contact us for the most current availability on this product. 300727QB2 Queen Bed Box 2 1 0" 0" 0"
300727QB1 Queen Bed Box 1 1 0" 0" 0"
Bed Construction Constructed with steel tubing and mold-casted ornaments to give the bed a stylish look that will last for years. Add a quiet elegance to your bedroom with this transitional bed. 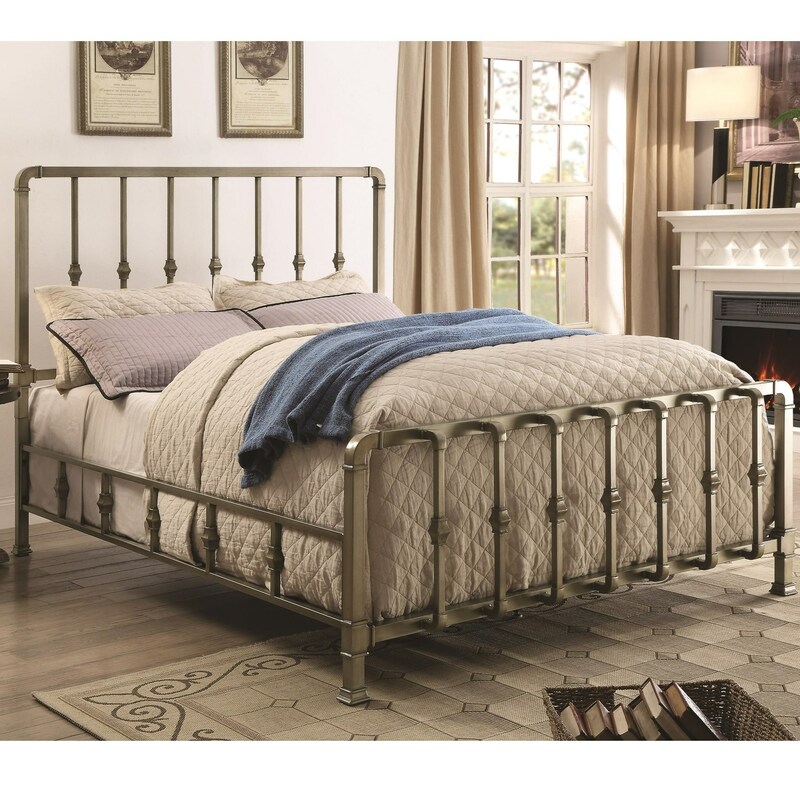 Featuring steel tubing construction, a hand-brushed antique champagne finish, and mold-casted ornaments, this bed will remain a fashionable part of your room for years to come. The Micah collection is a great option if you are looking for Transitional furniture in the New Jersey, NJ, Staten Island, Hoboken area.